The interdisciplinary research project JAK-Sys addresses the understanding of the complex signalling and influencing factors as well as the identification of therapeutic targets for myeloproliferative neoplasm (MPN). MPNs are a group of diseases of the bone marrow, in which most of the haematopoiesis occurs. The activating JAK2-V617F mutation is found in the majority of myeloid disorders [1,2], which constitutes that it and its specific signalling pathways (see image above) are attractive therapeutic targets. On the other hand JAK2 signalling is not only a factor for neoplastic cells, but also necessary for the normal haematopoiesis. Hence the complete eradication of the malignant clone is no therapeutic option. Currently only limited knowledge about the underlying molecular mechanisms as well as the resulting misregulations associated with JAK2-V617F expression exist. However, pure biological deduction and experiments are not sufficient to infer and understand the interplay of the involved factors due to the inherent complexity and the mixture of quantitative and qualitative biological and experimental information. The key methodology of this project is therefore to use combined quantitative and qualitative systems biology modelling approaches together with model-driven biological experiments. 2) to rationally identify suitable intervention strategies for therapeutic targeting of myeloproliferative neoplasms. Experimental and theoretical partners will closely collaborate to make this combined approach effective for elucidating key mechanisms behind aberrant JAK2 signalling and finally to predict the potential efficiency of intervention strategies to combat JAK2-V617F mediated myeloproliferative neoplasms. The objectives of this project can only be reached by a collaborative research approach, combining the expertise of clinical and experimental hematology (Fischer/Lipka), experimental molecular systems biology (Schaper), computational systems biology (Klamt), and systems theory with focus on systems biology (Findeisen). 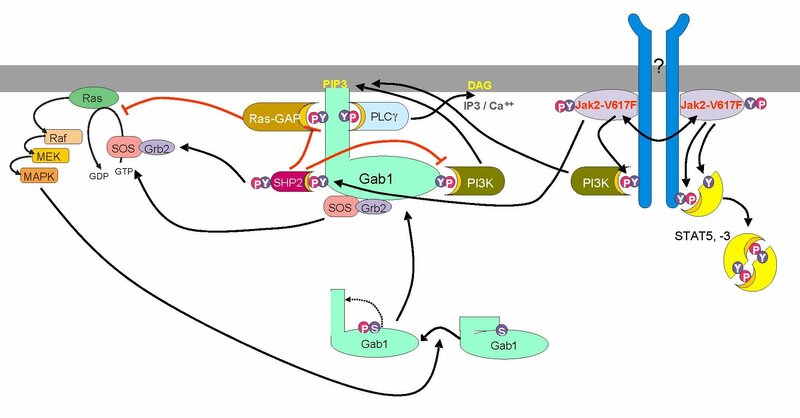 The Findeisen group together with the Schaper group have recently developed a first quantitative ODE model for the JAK/STAT/SHP2/ERK signalling pathways, which lays the foundation for the project structure. In this project novel approaches from systems theory and computational systems biology, which can deal with qualitative/semi-quantitave information and uncertainties and are therefore well-suited for the analysis of MPN, will be applied. Qualitative modelling (e.g. based on logical models or interaction graphs) as well as quantitative modelling (based on ODEs) will be employed in a combined and innovative manner to describe the relevant processes. In a typical systems biology approach, the expertises of the two theoretically and two experimentally working groups will be linked to test the different biological and computational/systems theoretic hypotheses in an iterative manner and to finally identify intervention strategies to combat MPN. The clinical research of Fischer/Lipka focuses on the development of moleculary targeted therapeuthics for acute and chronic myeloid neoplasms. Furthermore, they are experts in analysing oncogenic signalling of mutated tyrosine kinases in hematological neoplasms. The Schaper group has a long-standing expertise in analysing the molecular mechanisms of signal transduction of cytokines such as interferons and interleukins ans its regulation. The Schaper group also contributed significantly to the current understanding of the regulation of IL-6 type cytokines and the involved molecular interactions [3-5]. The research of Steffen Klamt focuses on computational methods for the analysis, inference and targeted modification of metabolic and signalling networks and the group collaborates with different biological partners to apply these methods to realistic networks. The Klamt group will focus on qualitative modelling first, working towards models with quantitative predictive power. Findeisen are experts in the development and application of novel systems theory, control engeneering, and optimization methods and, in particular, application and tailoring of the developed methods to systems biology with special focus on model reconstruction, (in-)validation, and analysis as well as intervention and experimental design. Their group will start with mechanistic and quantitative models for parts of the network and will aim at including quantitative findings in the models and their analysis. Jones, A. V.; Kreil, S.; Zoi, K.; Waghorn, K.; Curtis, C.; Zhang, L.; Score, J.; Seear, R.; Chase, A. J.; Grand, F. H.; White, H.; Zoi, C.; Loukopoulos, D.; Terpos, E.; Vervessou, E. C.; Schultheis, B.; Emig, M.; Ernst, T.; Lengfelder, E.; Hehlmann, R.; Hochhaus, A.; Oscier, D.; Silver, R. T.; Reiter, A.; Cross, N. C. Widespread occurrence of the JAK2 V617F mutation in chronic myeloproliferative disorders. Blood, 106, 2162-2168 (2005). Tefferi, A. Classification, diagnosis and management of myeloproliferative disorders in the JAK2V617F era. Hematology Am Soc Hematol Educ Program, 240-245 (2006). Heinrich, P. C.; Behrmann, I.; Haan, S.; Hermanns, H. M.; Müller-Newen, G.; Schaper, F. Principles of interleukin (IL)-6-type cytokine signalling and its regulation. Biochem J, 374, 1-20 (2003). Heinrich, P. C.; Behrmann, I.; Müller-Newen, G.; Schaper, F; Graeve, L. Interleukin-6-type cytokine signalling through the gp130/Jak/STAT pathway. Biochem J, 334, 297-314 (1998). Schmitz, J.; Dahmen, H.; Grimm, C.; Gendo, C.; Müller-Newen, G.; Heinrich, P. C.; Schaper, F. The cytoplasmatic tyrosine motifs in full-length glycoprotein 130 have different roles in IL-6 signal transduction. J Immunol, 164, 848-854 (2000).